Many of you may have difficulties enjoying music practice at your home due to sound disturbance for your neighbors. OTOREN provides a place for your daily music practice, not just a music studio for special occasions but for coloring your everyday music life. Our studios can be used in a variety of ways; for example your own practice, small ensembles or sessions, and lessons using the grand piano for teachers and students. Music levels range from beginners to professionals. 13 soundproof studio rooms with a variety of sizes and equipment designed by YAMAHA provide you with a high quality, comfortable, sound environment. OTOREN can help your dreams come true― “I want to be able to play this song”, “I wish to win the competition”, “I want to enjoy playing music with my friends”, or “Someday I will play on that stage”. We sincerely look forward to seeing you at our studio. Piano, Violin, Viola, Cello, Contrabass, Flute, Clarinet, Saxophone, Oboe, Bassoon, Trumpet, Cornet, Trombone, Horn, Tuba, Piccolo, Euphonium, Classic Guitar, Shakuhachi, Shamisen, Tsuzumi (hand drum), Sho Flute, Hichiriki, Ryuteki flute, Singing, Rakugo (traditional comic storytelling), Hula (only in Room M), Social Dance (only in Room M), Nihon Buyo (traditional Japanese dance) (only in Room M), Drama (only in Room M) and many more. No Annual membership nor registration fees are required. 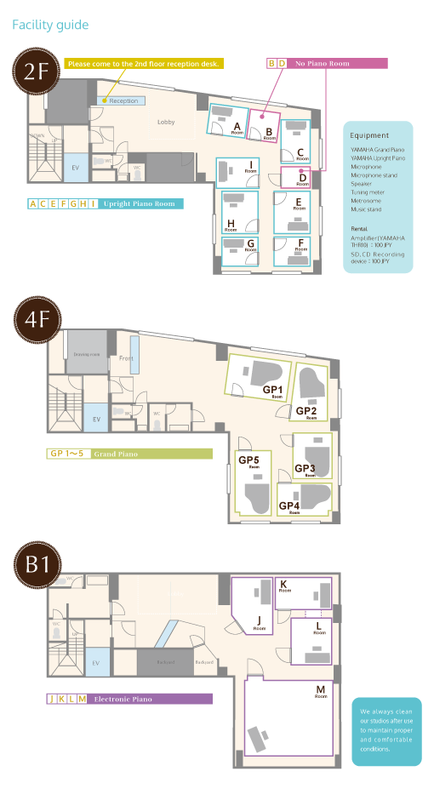 ※ All Charges are per room (number of people using the room does not effect the price). ※ Payment: CASH ONLY (sorry, no credit cards) Credit cards and e-money(Suica,Pasmo…) Accepted! ※ Cancellation Policy: Customers must pay 50 % of the rental fee when cancelling the reservation from 14 days prior to the previous day of the studio use, and 100% on the day of the reservation (Cancellation service is available between 10:00-21:00). ・Change of the studio usage date or shortening the length of time are considered as cancellation. ・Changing the time and studio type on the same day is possible. In this case, customers must pay the higher price of the studio. (Customers are unable to make any changes during weekends or on national holidays). ※ Customers must leave the studio 5 minutes before the ending time. ※ Customers must set up all the equipment by themselves. ※ When using a studio twice on the same day (e.g. 10:00 -11:00 and 11:30 – 12:30), rental costs for the equipment will be charged twice. ※ Cancellation of the equipment usage on the day is subjected to a 100% fee. ※Booking in advance is strongly recommended. When coming to our studio without booking, you may have to wait due to the booking priority policy. ※ Booking is available per every 30 minutes,starts from at the top of the hour and at the bottom of the hour. ※ Studio availability can be checked on our website. Please call us for booking after checking the availability. １：　Booking is available by either e-mail or telephone. You must book in advance before coming to our studio. ※ New customers can book only once. ２：　When coming to the studio, we ask to fill the membership registration (free of charge) which provides you a membership card. ※ Please arrive earlier than the booking time since registration requires 10-15 minutes. ※ Please have an official identification with your full name. We will photocopy it. ※ Reception desk and the register are on the second floor (2F). ３：　Please use the studio at booking time after the payment. ４：　Please leave the studio 5 minutes before the ending time. ※ Studio rental time includes 5-minute cleaning, which we require you to leave the studio. Studio staffs will immediately start cleaning after use. Do not disturb them by leaving your belongings inside the room or by the door. Alarm will ring on the 2nd floor and the light will flash at the basement to tell you to leave the studio immediately. Please read through the “Important Notice” written below prior to booking. １：　Booking is available either by telephone or via website. ※ Reservation or cancellation on the day of use cannot be made online (however, online cancellation before deadline is possible). Reservation is only available from the day before the desired date to the last day of the following month. Room availability can be viewed online anytime so please do check in advance. ※ Changing an existing reservation may result in cancellation fees (change is free of charge 15 days before the reserved date). Please make sure all details are correct when making a reservation. ２：　You will receive e-mail at your registered email address noticing booking confirmation. Please check the details. ※ You can sign in to your account and change your email address. ※ Always have your membership card with you whenever using our studio. In case of card loss, you will be charged 100 yen for a new issuance. ※ Studio requires 5 minutes of cleaning before the next customer comes, which we require you to leave the studio 5 minutes before the ending time. ※Booking in advance is strongly recommended. When coming to our studio without booking, you may have to wait due to the booking priority policy. Please be aware that customers are unable to make any changes during weekends or on national holidays. ※ No alcohol, no smoking. No food inside the studio (you may eat and drink at the waiting space). ※ Customer may use the waiting space for 15 minutes per group. ※ When using our studio for a music lesson or when members come later, please inform your students or members in advance with the room number or the name of the person in charge. ※ In case of card loss, you will be charged 100 yen for a new issuance. ※ Cancel charge must be paid by cash at the studio within 15 days (When difficult to come in person due to the place you live, bank transfer may be available). ※ Playing rock music, heavy metal, using music instruments up full blast, playing the electronic guitar, and putting percussion instruments on the floor are strictly prohibited in our studio. Please respect other customers: be careful not to bother them by wearing too strong perfumes or clothes that make them feel uncomfortable. In case we receive any complaints, we may ask you to leave the studio. Thank you for your cooperation in advance. Please be aware that JR Shinjuku station is NOT the nearest station. ※ No car and bicycle parking available. ※ We may not be able to give any service about the direction due to other customer services. Please check the direction before coming to our studio. ※ Our studio is very far from JR Shinjuku station. If you come here for the first time, we strongly recommended using Shinjuku 3-chome station [C8 Exit] of Toei Shinjuku Line, Fukutoshin Line and Marunouchi Line. Copyright © 音楽練習場オトレン All Rights Reserved.